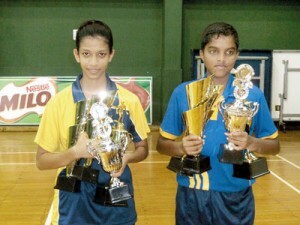 Hansani Piumila of Visakha Vidyalaya and Nimesh Ranchagoda of Royal College grabbed major honours by becoming the most outstanding players in Girls’ and Boys’ segments respectively at the AGSEP Western Province Open Ranking Table Tennis Tournament held at the Indoor Complex of S. Thomas’ College in Mt. Lavinia. Hansani won the Women’s Singles and the Under-18 Girls’ Singles while emerging as the runner-up in the Under-15 Girls’ Singles. Nimesh won Boys’ Singles titles in the Under-18 and Under-15 categories and went down fighting in the Men’s Singles to the much experienced Rasika Manoj of Sri Lanka Army. Hansani beat Yahani Mendis of Girls’ High School Mt. Lavinia in straight sets – 11/2 and 11/4 – to bag the Women’s Singles title comfortably. This feat came after she beat schoolmate Chamathsara Fernando 2-1 in the Under-18 Girls’ Singles final. Earlier on Chamathsara had given Hansani an unexpected shock, preventing the Most Outstanding Girls’ Player from bagging a triple crown, by winning the Under-15 Girls’ Singles championship by 2-1 after a great battle. Meanwhile Nimesh began his campaign aiming a triple crown with easy wins in the Under-15 and Under-18 Boys’ Singles. He beat fellow Royalist Helitha Hendawitharana 2-0 to bag the Under-15 title and followed the good form with a 2-0 straight win against another schoolmate Virunaka Hendahewa in the Under-18 final. But his dream of bagging a triple was foiled by experienced campaigner Rasika Manoj who beat him easily in the Men’s Singles final. The Under-21 Boys’ Singles championship was won by Suresh Pushpakumara of Sri Lanka Army who beat Nimesh Rashmika of Anura Central College Yakkala in straight sets. Dewmini Weerasena of Musaeus College had a cakewalk win against Vinodya de Silva of Royal Institute International School in the Under-21 Girls’ Singles final. In the Under-12 age category Jithara Warnakulasuriya of Ladies’ College was given a good fight for her trophy by Ayla Chitty of the same school in the Girls’ Singles final. Dewmith Weerasena of Lyceum International School Nugegoda too was made hard to earn the Boys’ Singles title when Thisas Ranchagoda of Royal College stretched the game to a three-setter. After losing the first set Senura Silva of Ananda College bounced back to beat Kumuditha Lakshan of Warapitiya Central College to win the Under-10 Boys’ Singles final. Despite losing the second set Sanaya Buddhadasa of Visakha Vidyalaya maintained her momentum to beat Minadi Savindula of Viharamahadevi Balika Vidyalaya Kiribathgoda in the Under-10 Girls’ Singles final. 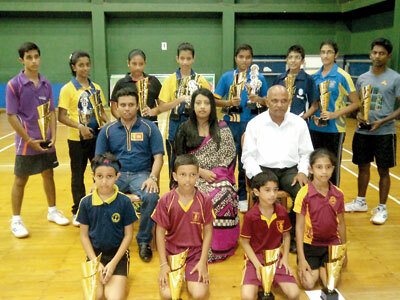 Rehan Senanayake of Ananda College beat teammate Kakeru Hennayake in straight sets to win the Under-8 Boys’ Singles championship while the Girls’ Singles championship of the same age group was won by Oshani Perera of President’s Girls’ School who beat Oneli Lehansa of Musaeus College. The tournament is one of the top ranking competitions organised and conducted by the Western Province Table Tennis Association. The chief guest at the awards ceremony was Dr. Wulakshi Wijekoon, the Senior Lecturer of the Medical Faculty of Malabe while former Sri Lanka table tennis player Dinesh Deshapriya was the guest of honour.